Surfing was a nomadic pass time that morphed into creative art on water. Self-expression and mind exploration possible through riding waves on a piece of wood, foam or anything that floats. Modern day surf culture, with the aid of technology has become a corporate beast. Inspiration and true originality has been sucked out of the art… thankfully, the underground still exists. The ethos behind 1WV1FN could be best summed up by Dane Peterson: 'Surf like nobody's watching.In today's social media world, instant fame can happen at the click of a button. With that in mind we went about carefully analyzing each eligible entry, looking for fun, frivolous and non-contrived surfing. Levi Prairie (@leviprairie) was the pick, although not technically perfect, he shelved innovation and brought inspiration to the table! All of Levi’s entries garnered attention from the judges, for better or worse it got us all talking but it was his 2nd entry that we decided to credit as his best. A quick fade, goose step to the nose and set position in the pocket for an 'Egyptian' style noseride followed by some fun hot doggin' not often seen in logging since early 1960s... how refreshing. In complete contrast, runner up Mick Rodgers displayed technical finesse and innovation while focusing on the classic noseride. The classy lady loggers once again displayed a beautiful variety of entries from around the world including Australia, Hawaii, United States, Mexico and Europe. There were some extremely hot surfing from many of the already well-known personalities but it was Hallie Rohr who best embodied the spirit of the 1WV1FN movement. Surfing free and easy at her local spot with a giant smile, linking noserides with excellent positioning, appropriate switch feet manoeuvres and smooth from start to finish… it was a beautifully ridden wave. In the end there were many great entries demonstrating a repertoire of traditional surfing elements on a variety of waves - point, beach and reef breaks. The judges noted both technical and stylish surfing more so than length of ride, which should be encouraging to many surfers faced with average conditions, but in the end there were a handful of waves that stood out. By harnessing social media, we’ve had a great display of fine logging so easily accessible through the Instagram 'hashtag'. This year’s contest proved to be a large success thanks to the logging community's participation and the support of Weedmaps. 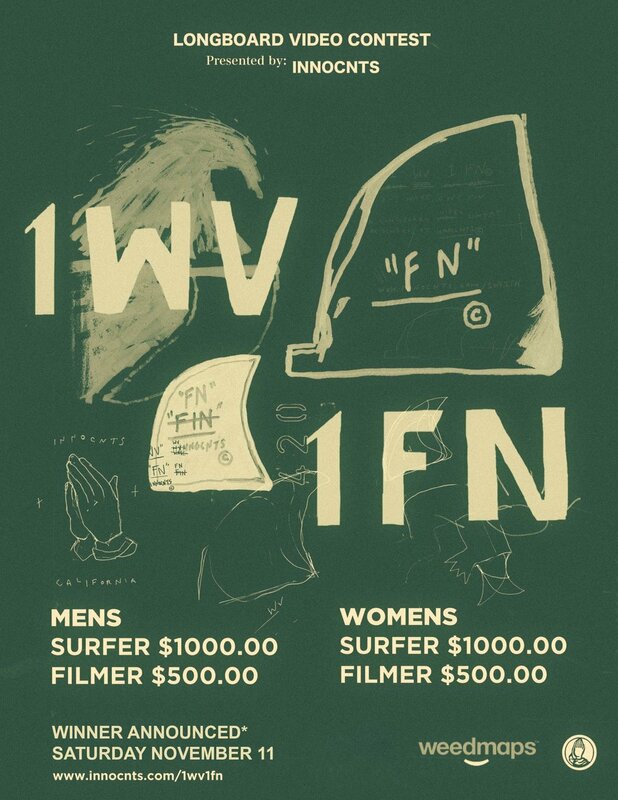 As promised this year’s winners will receive $1k in prize money and an invite to a future Joel Tudor DTI of their choosing. Big thanks to all that entered waves and shot video. We look forward to picking again sometime next year! ALL GROMS WIN!!! ALL GROMS WILL RECEIVE $50 EACH THANKS TO STUDIO 540. PLEASE DM @INNOCNTS TO SETUP PAYMENT. CONGRATS AND GOOD LOGGING!!! Our second annual 1WV1FN contest just wrapped up and the judges are currently working away at deciding the winners for both men and ladies. Here's a few entries for your viewing pleasure. You can check all the fine entries here as well if interested. Winners will be announced Saturday, November 11th at 5pm via our website and Instagram account. Wasn't sure if we were gonna get it together and launch the 1wv1fn contest this year but with a little help from our friends at weedmaps seems it is indeed on. Very pleased to officially launch the 2017 1wv1fn longboard video contest. Not much has changed this year regarding the rules (please see website), same concept and judging criteria. Stoked to have 6 top logger judges calling it like they see it. No secret handshakes or invites. Best wave wins. Simple as that. With the help of Weedmaps we are now offering an equal prize purse of $1000 for both men and women and $500 for each videographer. Contest will run till October 31 opening up the wave possibilities for multiple regions around the world. Pretty easy money if you can get on it and find the right wave. Stoked to see what comes of the contest this year! Diggin heavy on this new design by our dude D.J. Javier. The Innocnts #1WV1FN Longboard Video Contest has been extended till September 30th at which point our distinguished judging panel (Bob McTavish, Jimmy Gamboa, Kassia Meador, Matty Chojnacki, Michel Junod, and Steve Cleveland) will choose a winning wave. Winner gets $1300 usd and an entry into a future Vans DTI Contest. Up to 5 wave entries allowed per surfer. Still some time left with plenty of logging waves out there. Much appreciation to Vans and Studio 540 for matching our initial $600 prize purse bringing the total $1800!